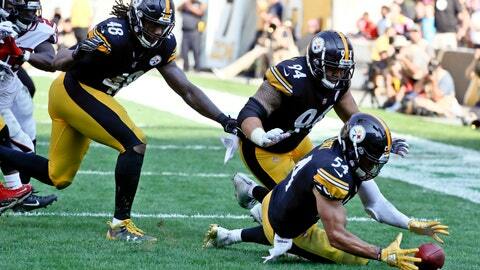 PITTSBURGH (AP) — Joe Haden understands how it looks. Spend an afternoon keeping the NFL’s leading wide receiver in check and you’re bound to get all the credit. Yet the veteran Pittsburgh Steelers cornerback understands he didn’t exactly shut down Atlanta’s Julio Jones during a dominant 41-17 win on Sunday all by himself. The Steelers sometimes had two — and on occasion three — bodies around Jones. And a resurgent pass rush forced Falcons quarterback Matt Ryan to spend a significant portion of the afternoon under heavy duress. So do the rest of the Steelers (2-2-1), who for the first time this season looked like the group that led the NFL and set a franchise record with 57 sacks in 2017. T.J. Watt took down Ryan three times. Defensive tackle Cam Heyward picked up a sack and split another with linebacker Jon Bostic. Even reserve linebacker L.J. Fort got in on things, collecting the third sack of his six-year career and later falling on Ryan’s fumble in the end zone to put the finishing touches on Pittsburgh’s most complete performance of the year. Though Heyward downplayed the idea his team was desperate, he admitted there was a sense of urgency after the Steelers spent the first month of the season getting pushed around. The Steelers walked onto the steamy Heinz Field turf ranked 30th in total defense. Facing the high-powered Falcons, Pittsburgh responded by restoring a bit of normalcy by getting back to basics. They blitzed from all over. They disguised their coverages and then turned to Haden to put the clamps on Jones. The idea to have Haden shadow Jones came from coach Mike Tomlin, who broached the subject of having Haden follow Jones all over the field during the week. Haden welcomed the assignment, galvanized by the opportunity to take on one of the best in the business. At least until the first three quarters on Sunday, when Jones did nothing. Four times Ryan looked Jones’ way over the first 45 minutes. Each time the play ended the same way: with the pass falling incomplete. By the time Jones finally did break through early in the fourth quarter, the Steelers were already up 17 and the game was effectively over. “They had a good game plan for me today,” Jones said. One Pittsburgh might want to repeat going forward. The Steelers travel to AFC North-leading Cincinnati (4-1) next week. Much like the Falcons, the Bengals and star wideout A.J. Green present their own unique challenge. The Steelers have dominated the rivalry in recent years, winning 9 of 10, including an ugly victory in Cincinnati last December that included several vicious shots on both sides and the possible end of Steelers linebacker Ryan Shazier’s career because of a spinal injury. Pittsburgh’s defense hasn’t been the same since, though the way the Steelers put it together against Atlanta offered a glimpse that perhaps things are starting to turn around. The communication issues in the secondary that plagued them in September largely vanished, at least for four quarters. And while Watt’s three sacks boosted his season total to six — tying him with older brother J.J. of the Houston Texans and Bengals defensive lineman Geno Atkins for the most in the NFL — Watt was quick to praise Fort and Tyler Matakevich, who stepped in admirably with Vince Williams sidelined by a hamstring injury. “I think we have so much confidence in them that we don’t have any wavering opinion whether they are in the game or not,” Watt said. Yet success has been fleeting. Pittsburgh thought it had figured some things out two weeks ago in Tampa Bay when it produced four turnovers in the second quarter to cool off the Buccaneers. Then Baltimore came to Heinz Field and controlled the second half on its way to a decisive victory. Whether Pittsburgh’s play against Atlanta is a one-off or a sign of things to come is uncertain. “Hopefully this performance can catapult us in the right direction, and start climbing the leaderboard of defenses and continue to win,” Fort said.